Imphal, August 26 2012: Congress MLA Victor Keishing representing Phungyar AC has reassured the people of his constituency to fulfil what he promised in his election manifesto. 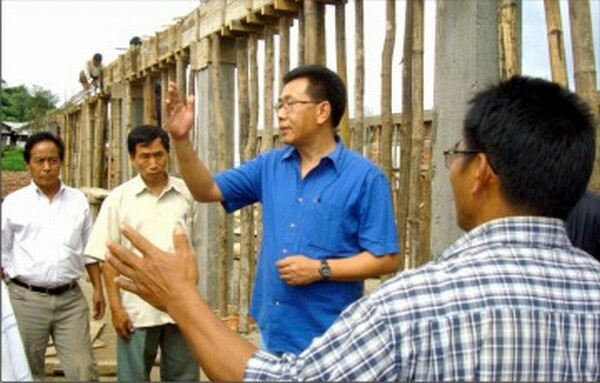 For the first time after being elected as an MLA, Victor Keishing Phungyar visited Phungyar sub-divisional headquarters within his home constituency on August 24 and 25, and made a direct assessment of the people's requirements besides inspecting development works/schemes being implemented there. The MLA's entourage included MANIREDA Director Manglem, the Phungyar SDO, PWD AE and leaders of the Youth Congress. In the course of his two-day visit, the MLA inaugurated newly constructed village courts of Maileng, Ramsophung (Khongjal) and Alang villages. The MLA and his team also conducted spot assessment of the ongoing construction works of a market shed, PHC building and the SDO office building at Phungyar sub-divisional headquarters. The village courts were constructed from the local area development fund of Rajya Sabha MP Rishang Keishing. Addressing a public meeting at Phungyar town hall, Victor Keishing said that implementation of development projects in Phungyar Assembly segment costs more funds as it is geographically quite large. Yet, expensiveness cannot be an excuse. Development works must be implemented with a commitment in the interest of the people. He also promised to fulfil what he promised in his election manifesto. Stating that the village courts were meant to deliver justice to villagers, the MLA said that the court buildings were constructed as these courts are essential under tribal customary law. He also appealed to the authorities concerned to make all trials at these courts impartial. Talking about transport infrastructure, Victor Keishing said that Union Minister of State for Defence during his visit to Imphal agreed in principle to entrust the work of constructing Sangshak-Tengnoupal road to the BRO. Relevant Ministry would be consulted to develop the road from Sangshat to Phungyar sub-divisional headquarters. Appealing to all the cultivators to give up the practice of jhum cultivation in view of its adverse impacts on environment and climate, Victor exhorted the gathering to cultivate a habit of preserving forests. If one is aware of their rights, one should be equally aware of his/her responsibilities. The pace of development can be accelerated considerably when each and every citizen are aware of their responsibilities and act accordingly, Victor asserted. Expressing displeasure at the manner the PHC building was being constructed, he cautioned that conditions of patients would only aggravate if they are treated in such building which was allegedly being constructed without giving any thought to its qualitative aspect. Observing that people have reservations to even enter inside the building because of its sub-standard quality, the MLA assured that he would take up the matter with the concerned Minister so as to construct the PHC building anew. The SDO office building which is nearing completion would be repaired first before it is inaugurated. He also appealed to all concerned to submit work proposals after consultation with village authorities. MANIREDA Director L Manglem informed the gathering that the Government of India has given its consent to provide 100 solar street lamps to each of the 60 Assembly Constituencies. Under the same project, Phungyar would get 100 street solar lamps, he added.